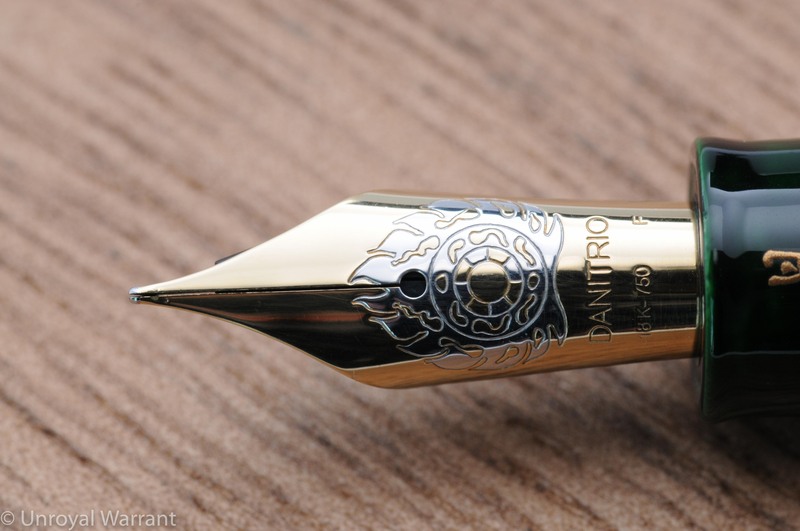 The Yukari Royale is an oversize fountain pen similar in size and shape to a Montblanc 149. 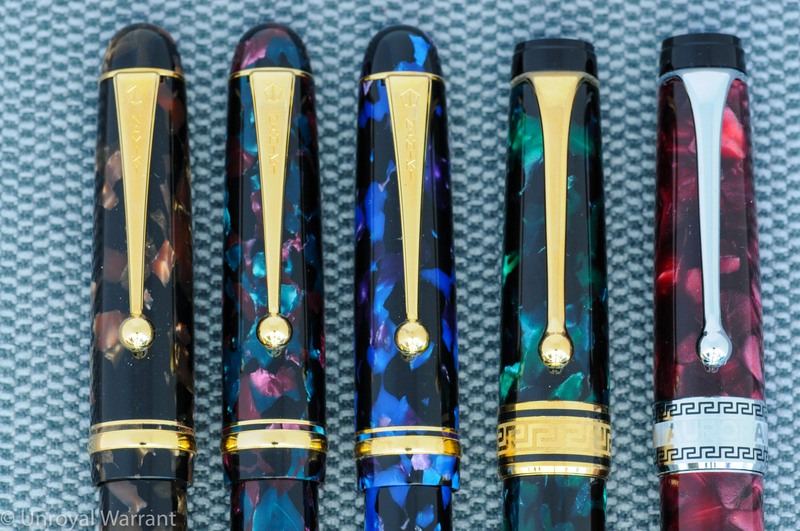 Despite it’s oversize form the Yukari Royale sits mid-pack in the Namiki line-up; there is the standard full-size Yukari and the comically enormous Emperor. Earlier this year in Japan I tried both the Yukari Royale and the Emperor in person. I quickly ruled out the baseball-bat-sized Emperor but the Yukari Royale I struggled with for a little while. 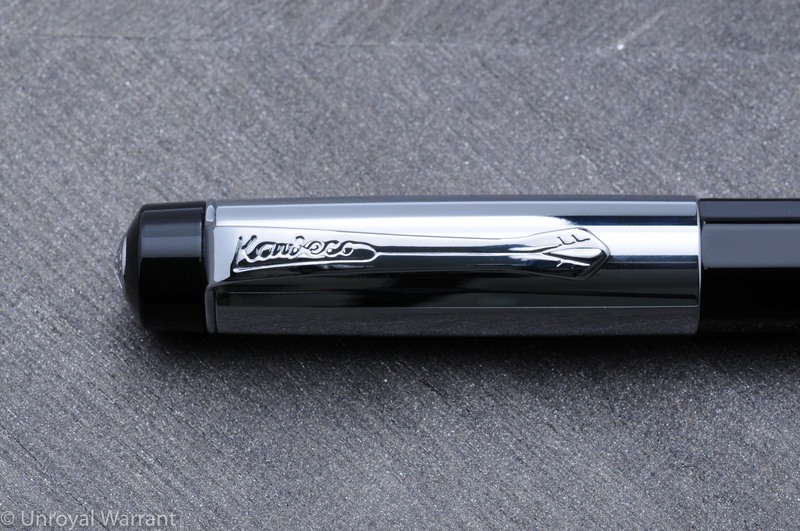 I thought “how could a pen so big and heavy be so comfortable?”; ultimately I decided not to take the risk on such an expensive pen and I bought a Platinum Izumo Yagumonuri instead. 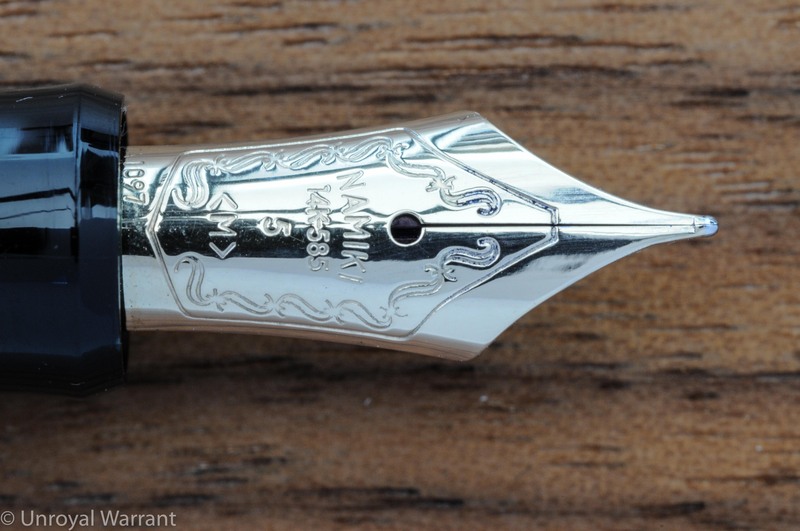 Fast forward a few months and I was still thinking about the Yukari Royale and at the same time feeling disenchanted with the Izumo (the Izumo has a long section with a large step down that causes me discomfort in long writing sessions). I ended up going for the Yukari Royale (thank you to Pen Chalet for making this possible). 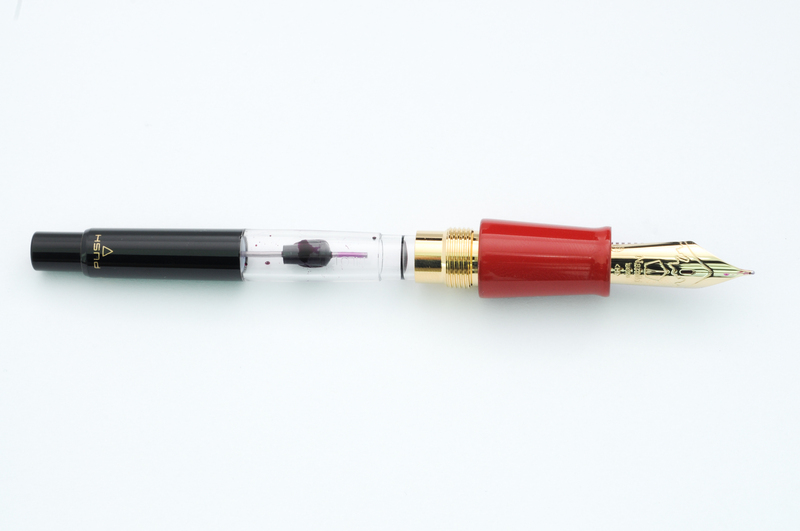 The Yukari Royale has a large brass torpedo-shape body covered in vermilion (red) urushi lacquer (also available in black). 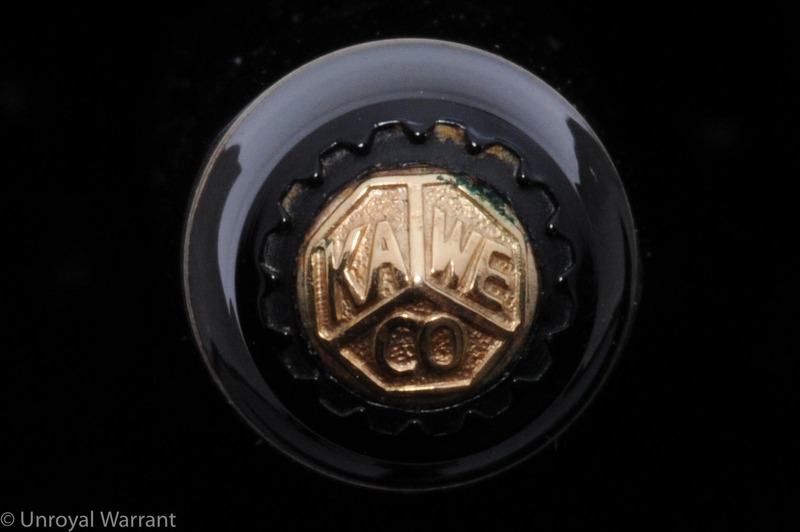 The cap has Namiki’s (Pilot’s) ball clip and a very thin gold band at the end of the cap. 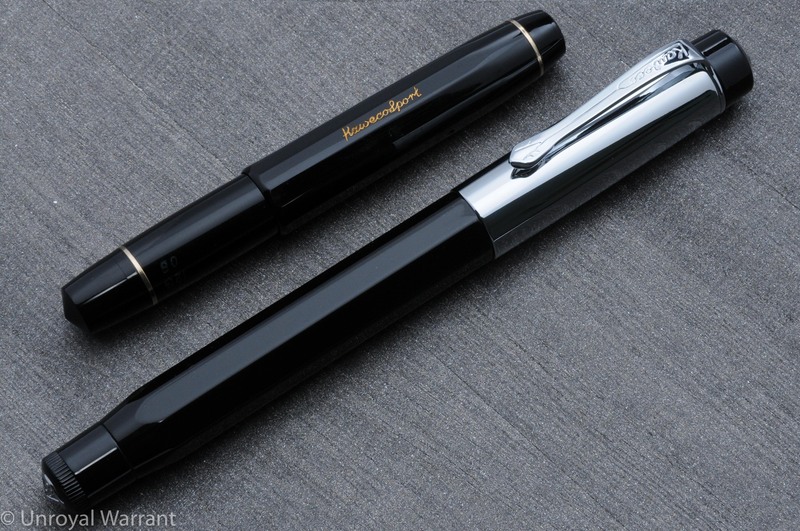 The simple shape and minimal trim make for a very elegant pen. 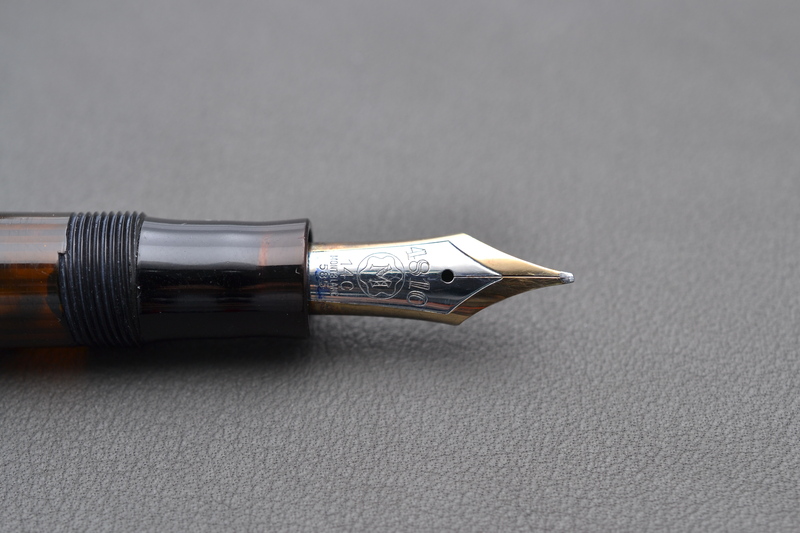 The fit and finish of this pen is flawless. It really is perfect to the point where I genuinely question if it is in fact hand painted. 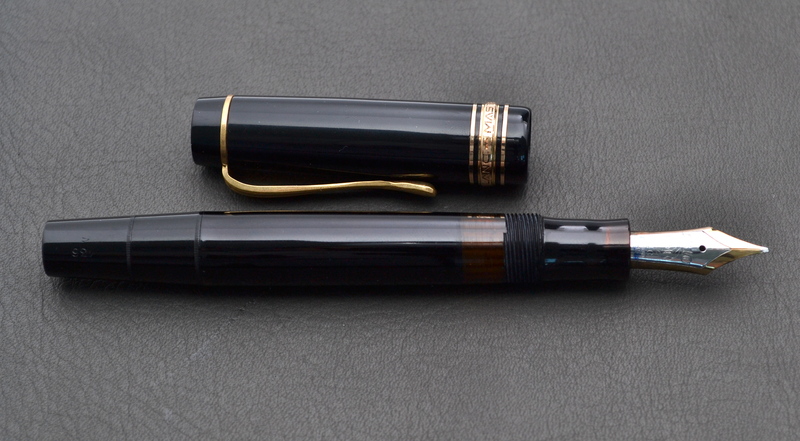 Next to a Nakaya the difference is night and day. 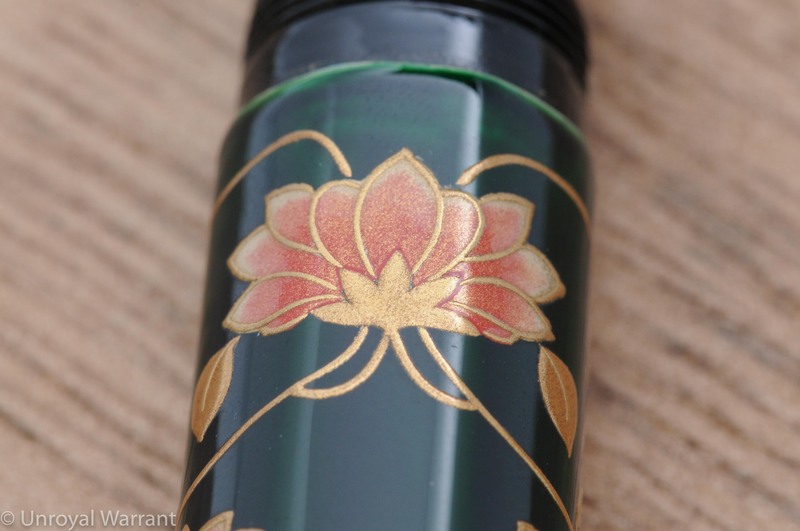 That is not to say that there is anything wrong with a Nakaya, there isn’t, a Nakaya has more of an organic beauty. 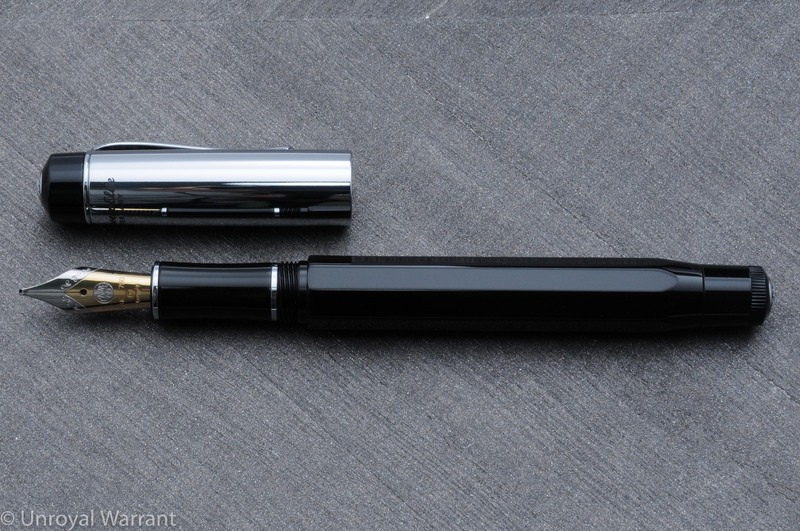 This pen weighs a hefty 45 grams but it is so well balanced in my hand that I don’t feel any fatigue from its weight. 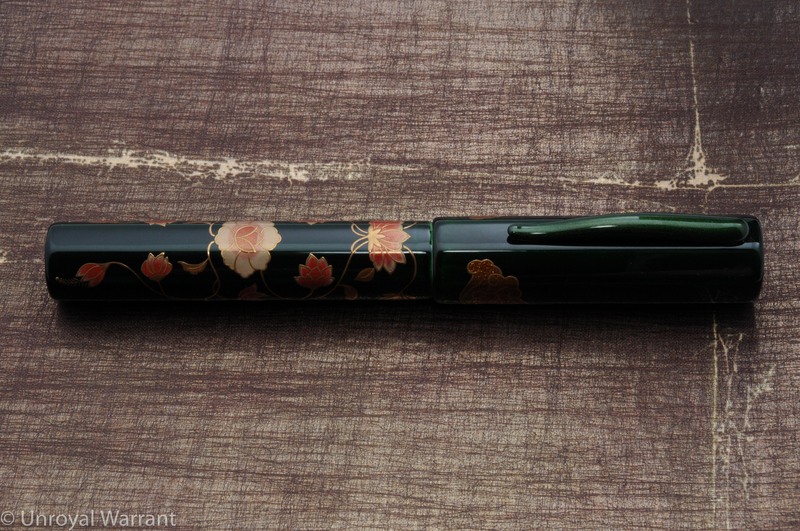 My other Namiki pens, a Nippon Art and a Yukari (non-Royale) share this same wonderful balance. 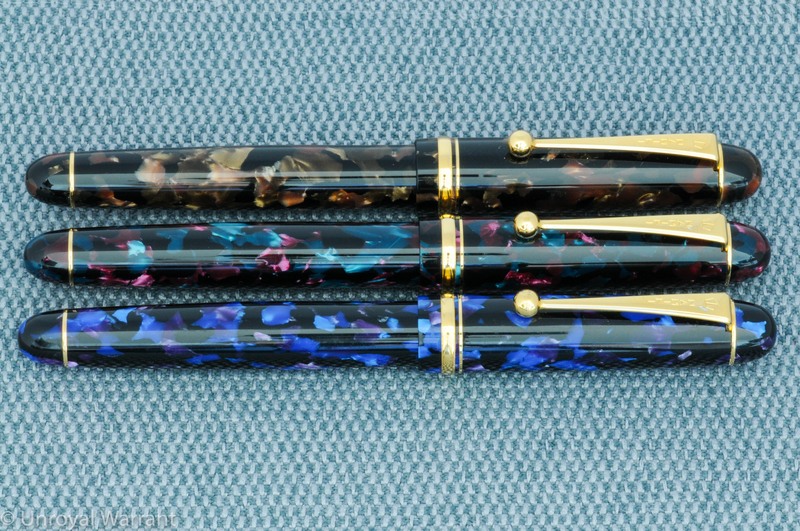 The Yukari Royale measures 5.8” capped. 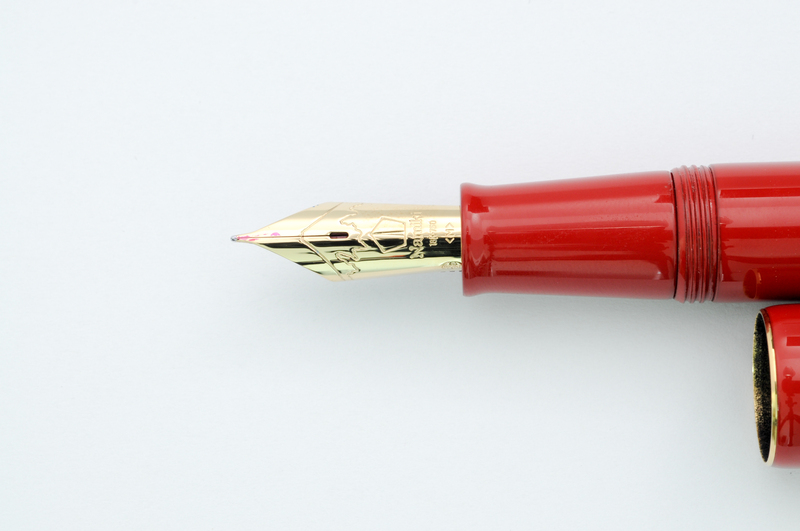 You can post this pen but it becomes too long for me. 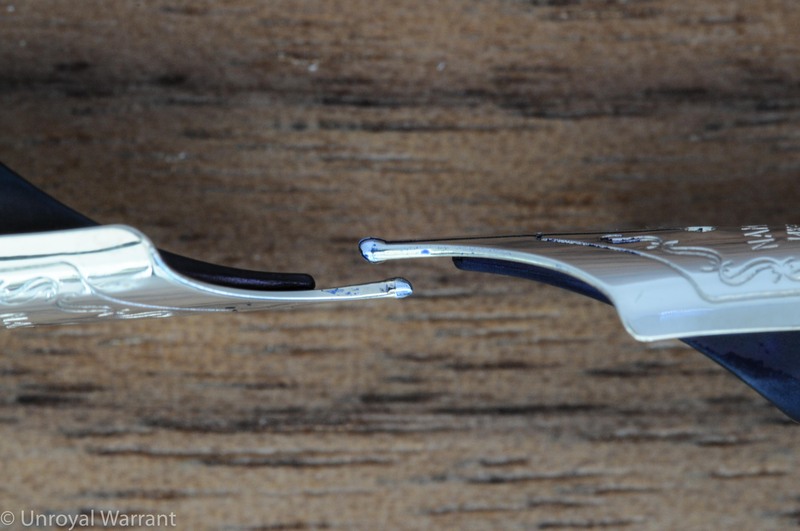 The grip section is about .4” in diameter which is thick but not as thick as a Montblanc 149s which measures over half an inch. 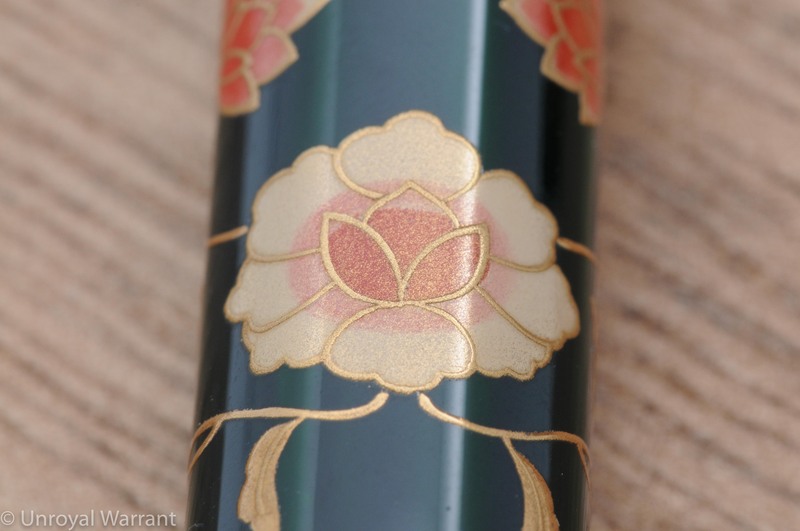 The Yukari Royale is the only pen pictured above to feature an urushi painted metal section. 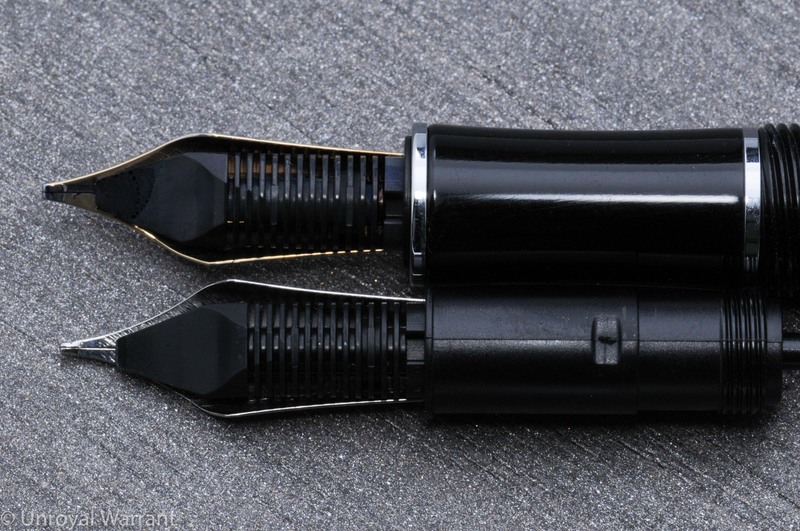 All of the other pens (even the more expensive Yukari Nightline) have unpainted plastic sections with visible seams. 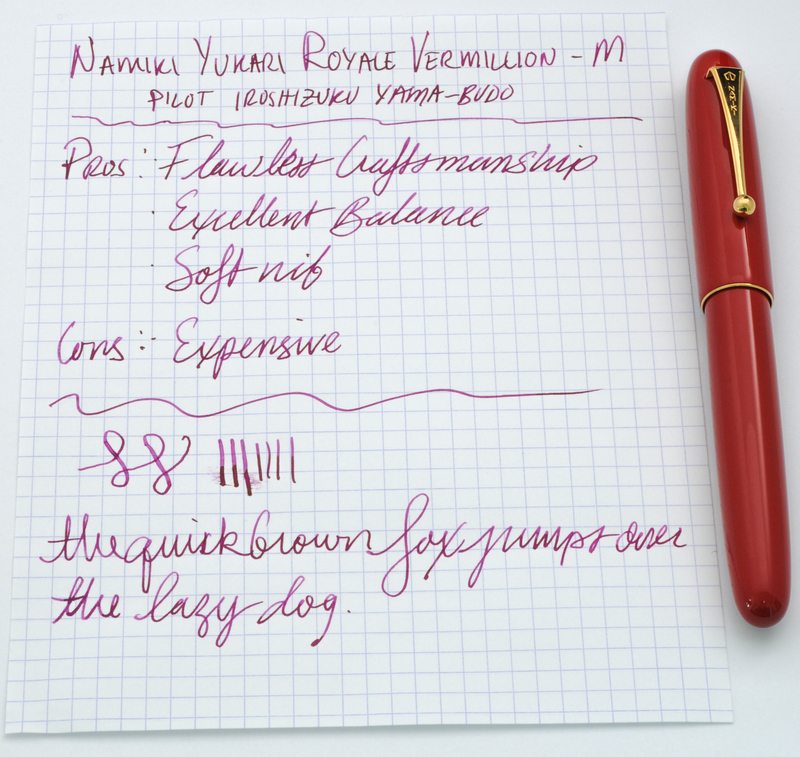 The Yukari Royale (using Pilot’s sizes) is a #20. 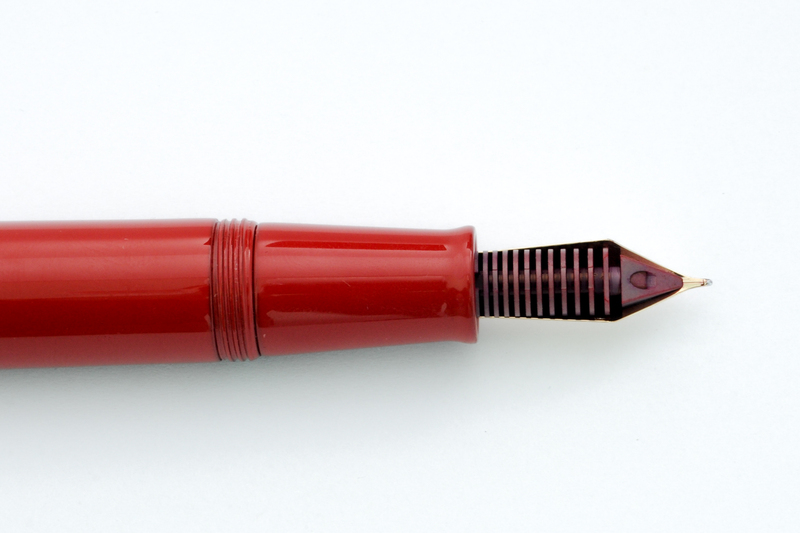 Interestingly, it is the same size as a Pilot #15 but with a different shape and an oblong breather hole as well as a red plastic feed. 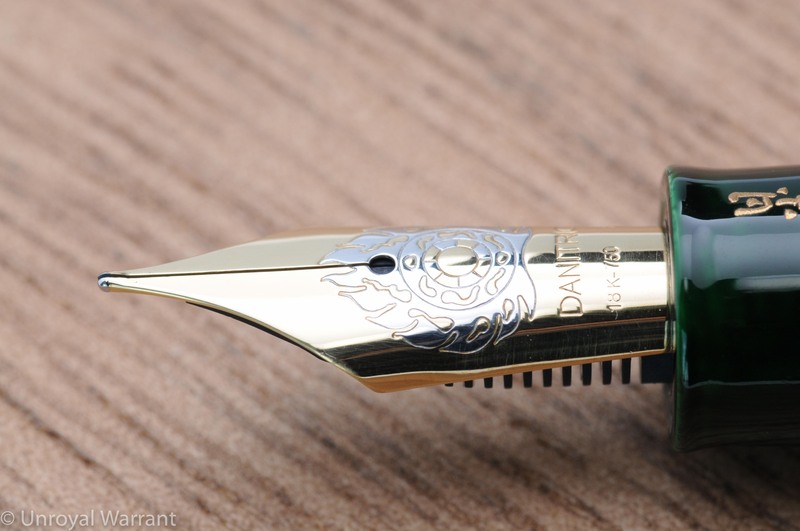 The nib is made of 18kt gold and is quite soft. The performance is excellent. 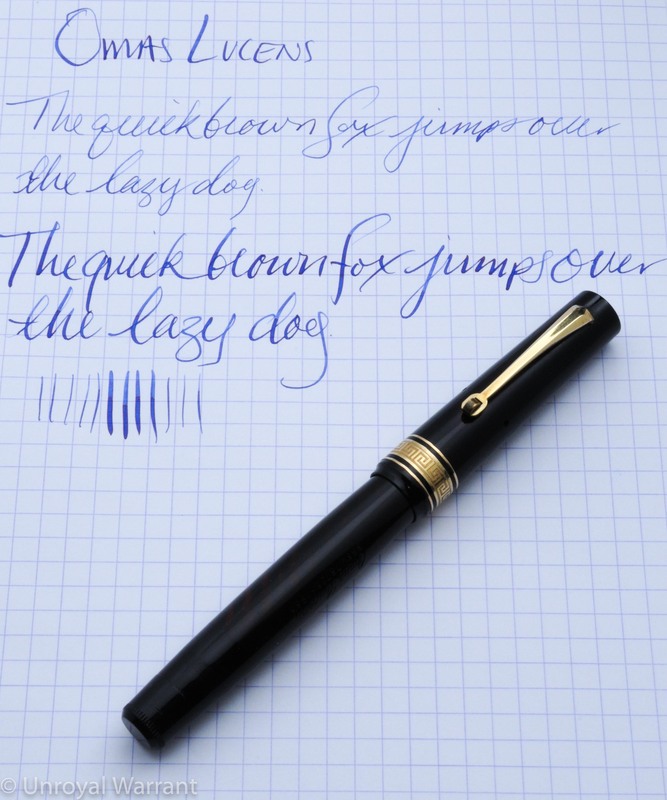 No skipping no hard starting; this pen just works. 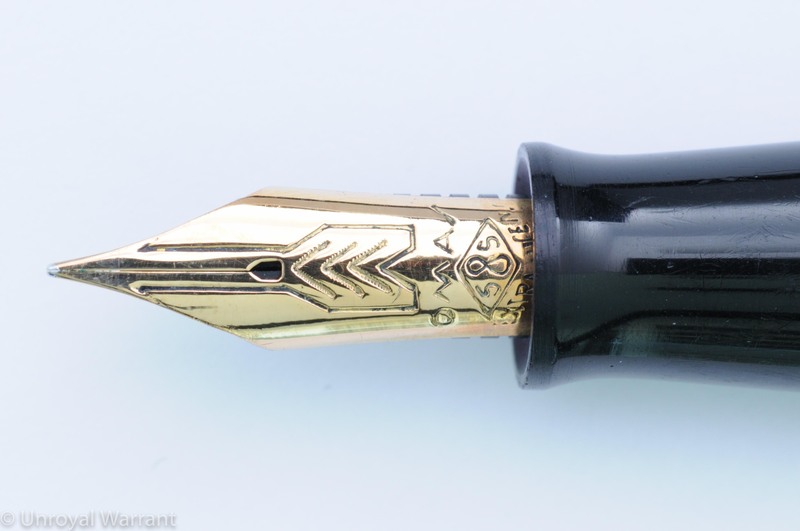 Out of all of my modern pens this is by far my favorite stock nib in my collection; it’s character is unique and lovely. 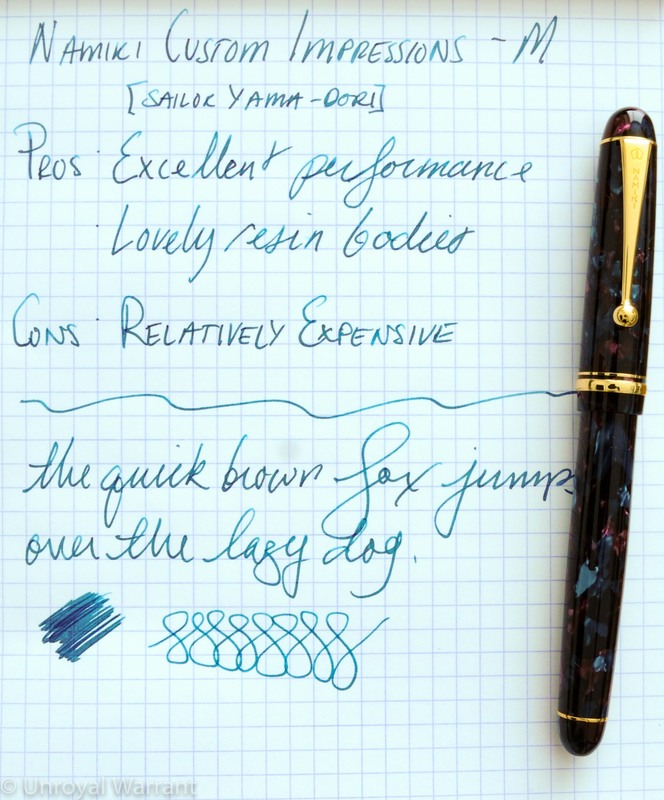 Compared to my other Pilot and Namiki medium nibs which are butter smooth, the number 20 has a small amount of feedback which I love. 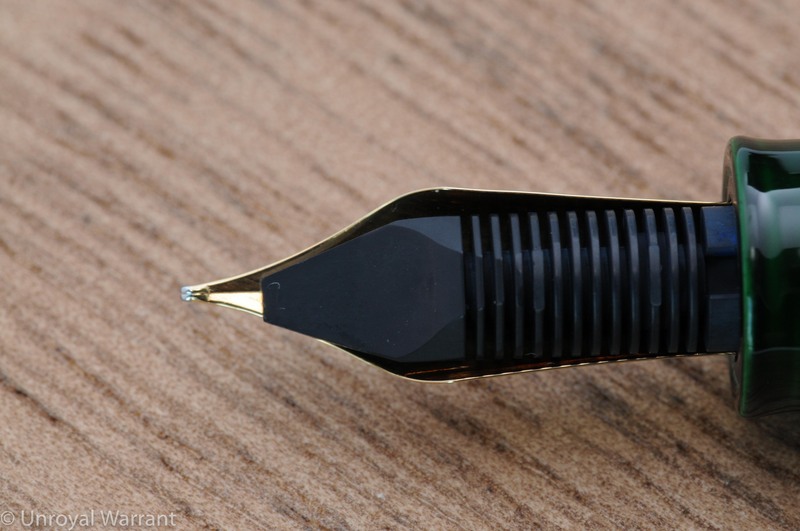 It sort of reminds me of the feedback from an Aurora Optima nib with the softness of a Montblanc 149 nib…in other words this is a dream nib (for me at least). 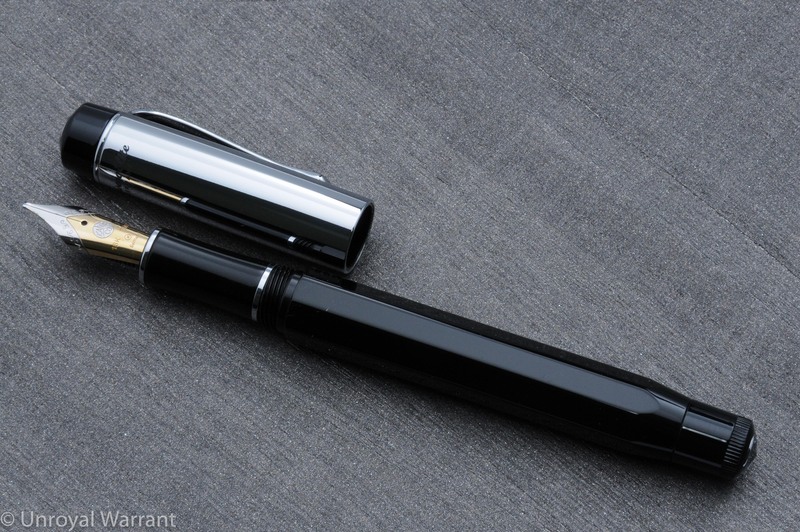 With it’s large nib and feed this is a thirsty pen. 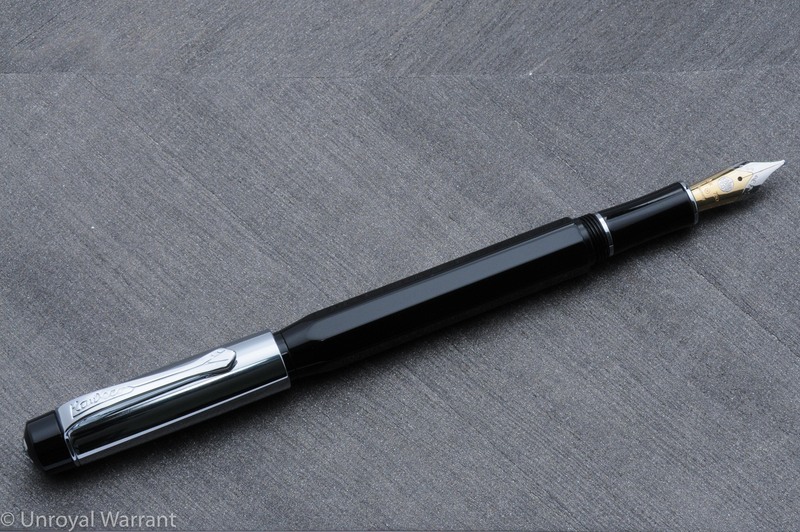 It uses a Con-70 converter that holds 1.1ml of ink and even with this large capacity I find that I run out of ink rather quickly. I also must admit that I am not as huge a fan of the Con-70 as I once was. 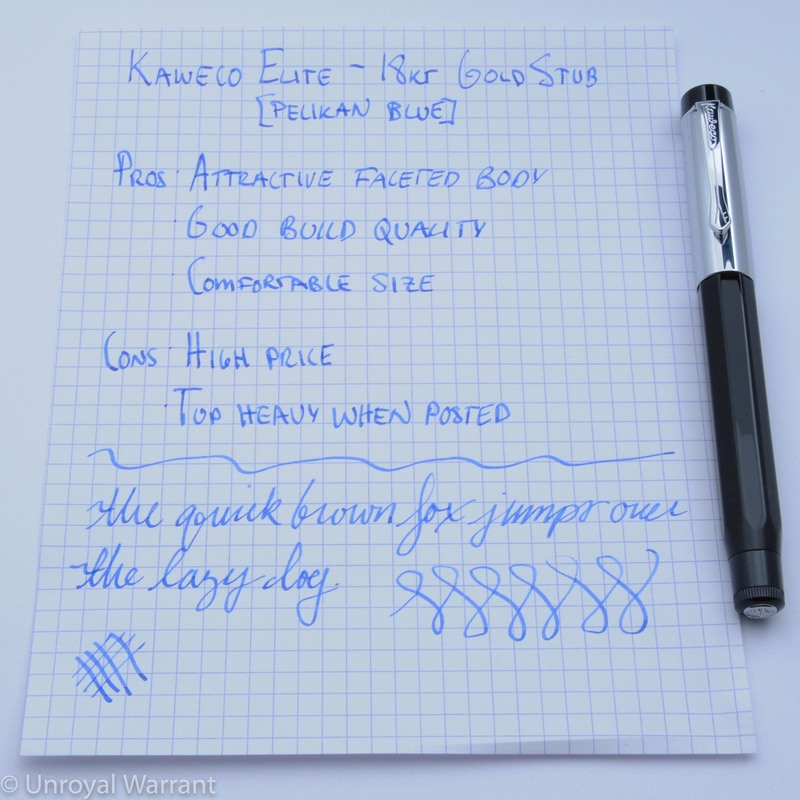 While it holds a lot of ink, it is the most difficult to use and the most difficult to clean converter on the market. 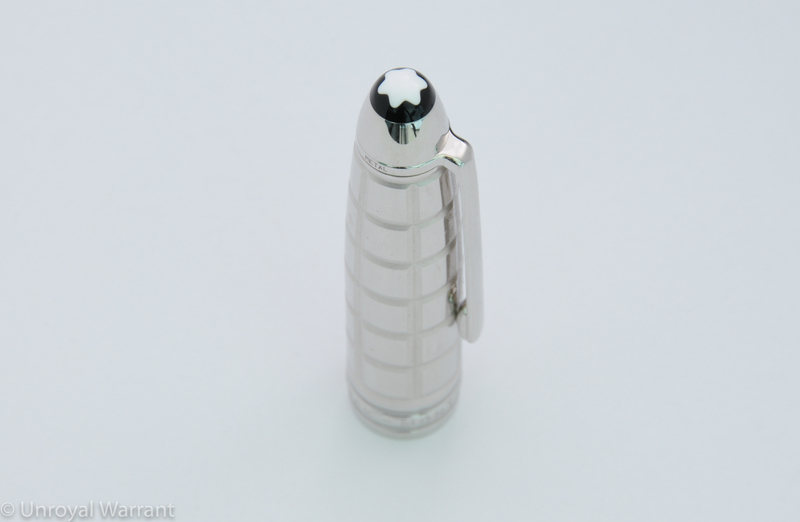 I fill and clean mine with a blunt tip syringe. So what about the price? 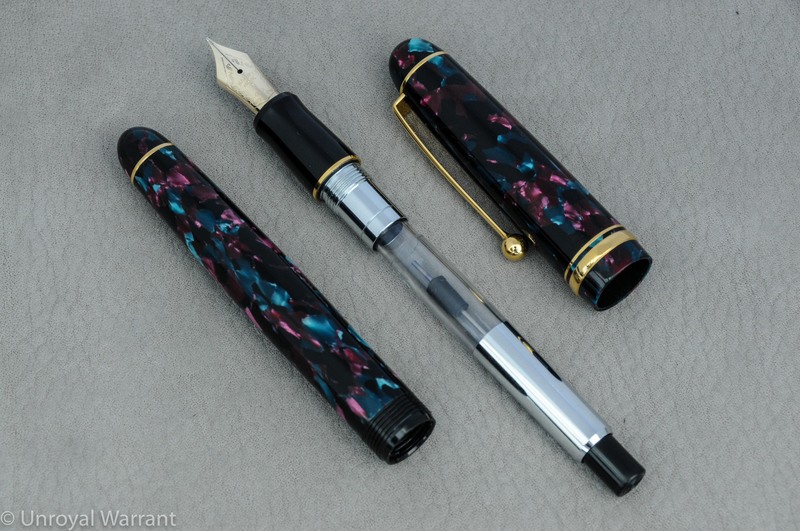 As I said earlier this is an expensive pen. The street price is $1,200 ($1,500 full retail). 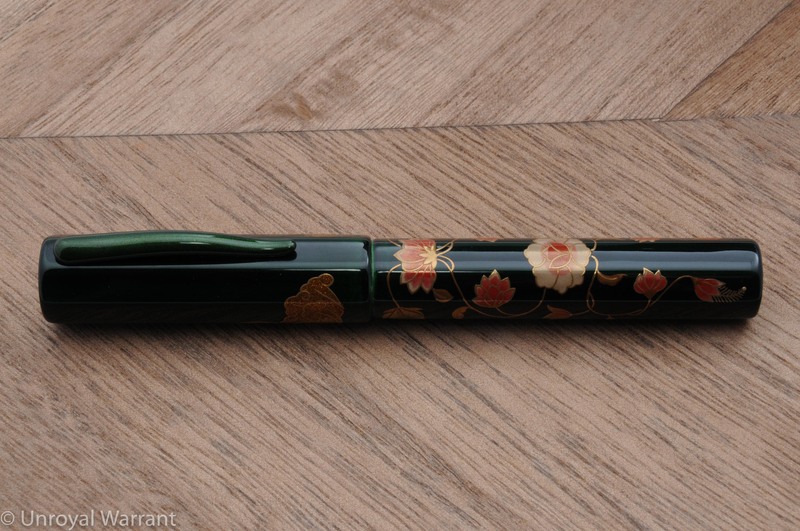 I get a lot of enjoyment of the Yukari Royale and while I have a lot of wonderful pens this is the only one that I have refilled six times in a row…I just don’t want to put it away and to date I haven’t yet. Is it worth it for you? 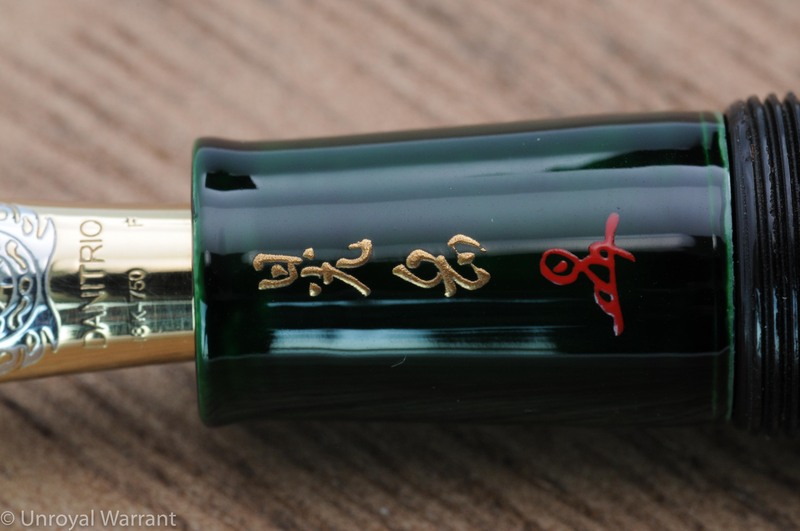 Rationalizing a pen this expensive is a fool’s errand (though I have tried in past reviews, see Nakaya Naka-ai). 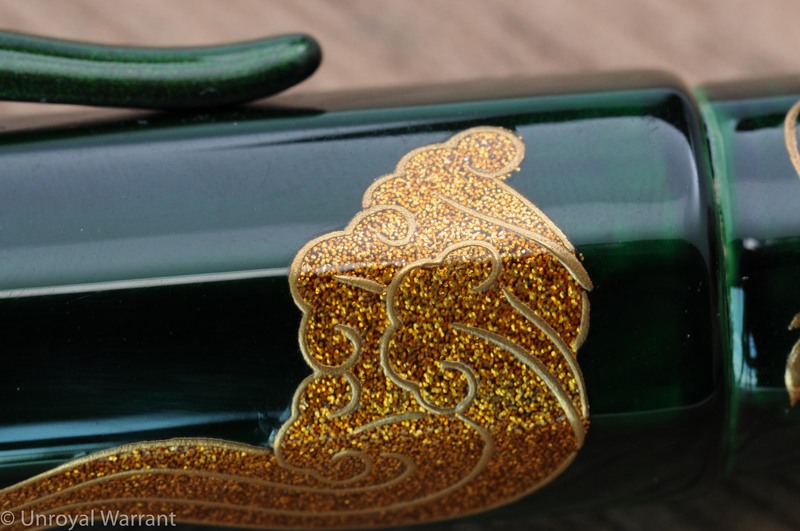 The Yukari Royale is a wonderful jewel of a pen to behold. A special thank you once again to Pen Chalet for making this review possible. 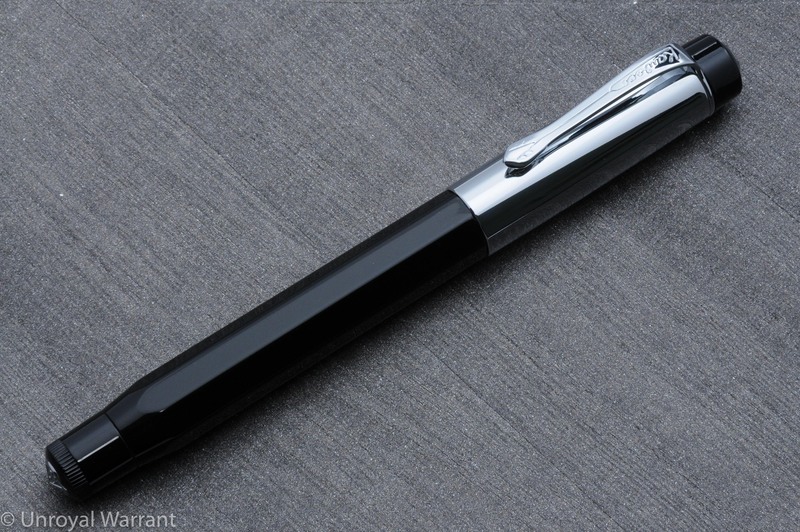 If you buy a pen as nice as this you will want to purchase from a reputable authorized dealer with great customer service like Pen Chalet. 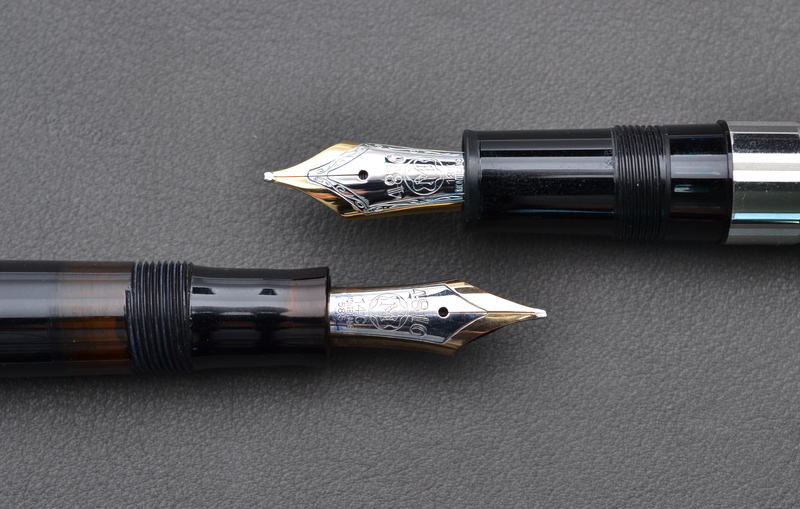 The 13X series of pens were the first Montblancs to feature a piston filling mechanism. 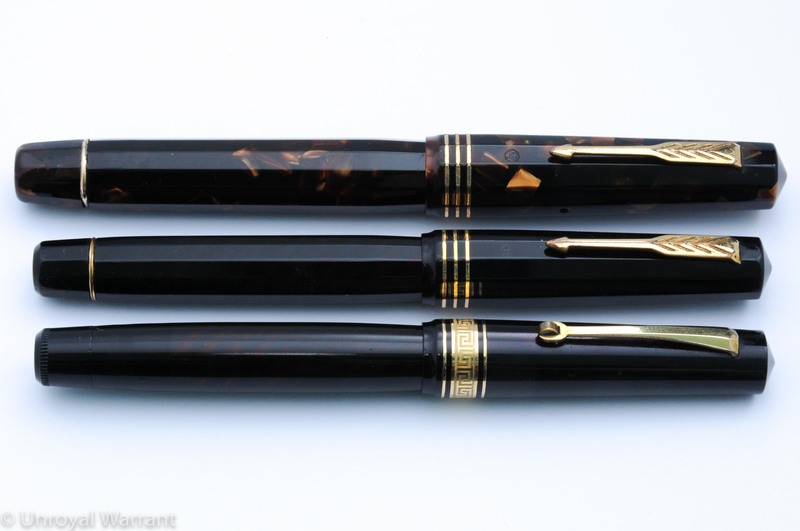 The 136 was the senior size pen just as the 146 is today in the current Meisterstück line. 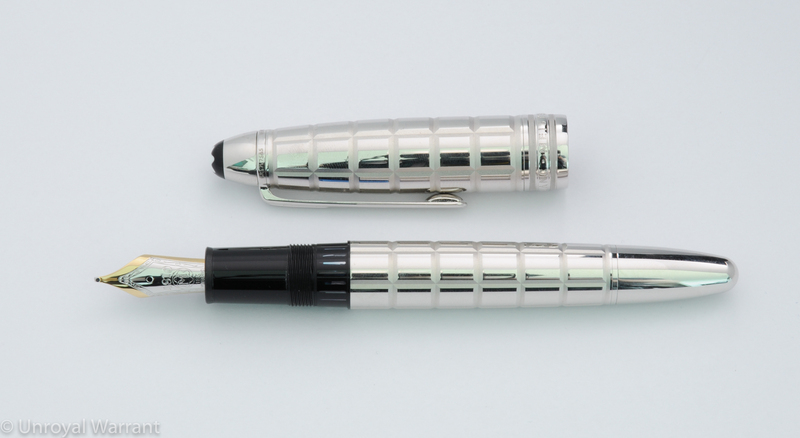 The 13X series was produced in the mid 1930s to the end of the 1940s and possibly into the early 1950s as there was a brief point when the 13X line and 14X were sold simultaneously. There are several variations of the 136 which I won’t cover here other than to say that my version is a later model with the shorter ink window. The differences between the 136 and the original 146 were mostly in design. 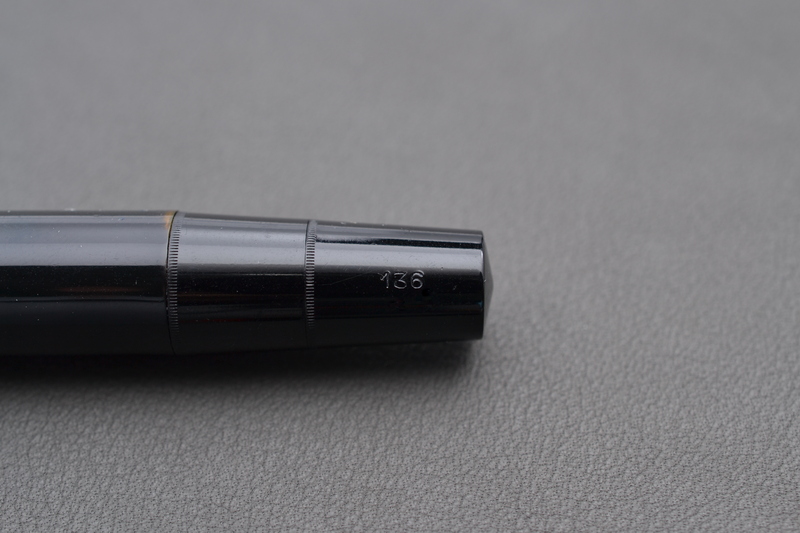 The 146 had (and still has) a streamlined cigar shape where the 136 has more of a flat top. 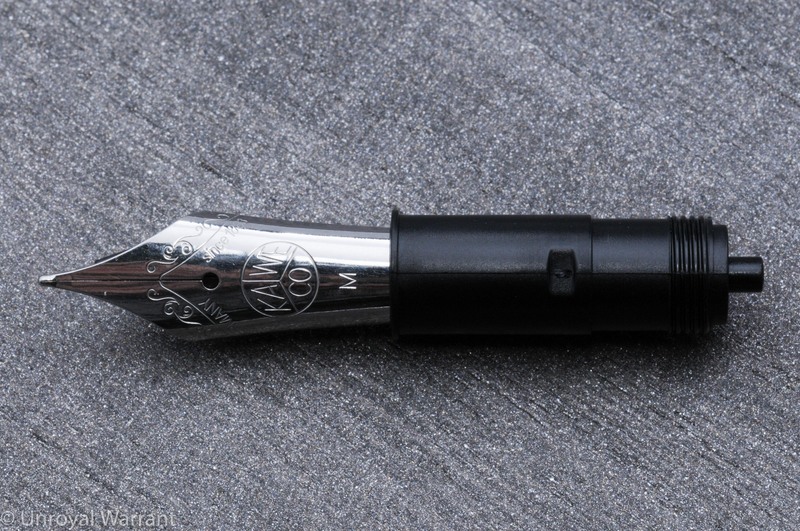 They both had the same telescopic piston filling mechanism but if you look at the end of the barrel on a 136 you can see two knobs…the one at the very end is the regular piston filling knob you use to draw ink into the pen and the one below that is used to remove the actual piston filling mechanism…this makes repairs slightly easier. 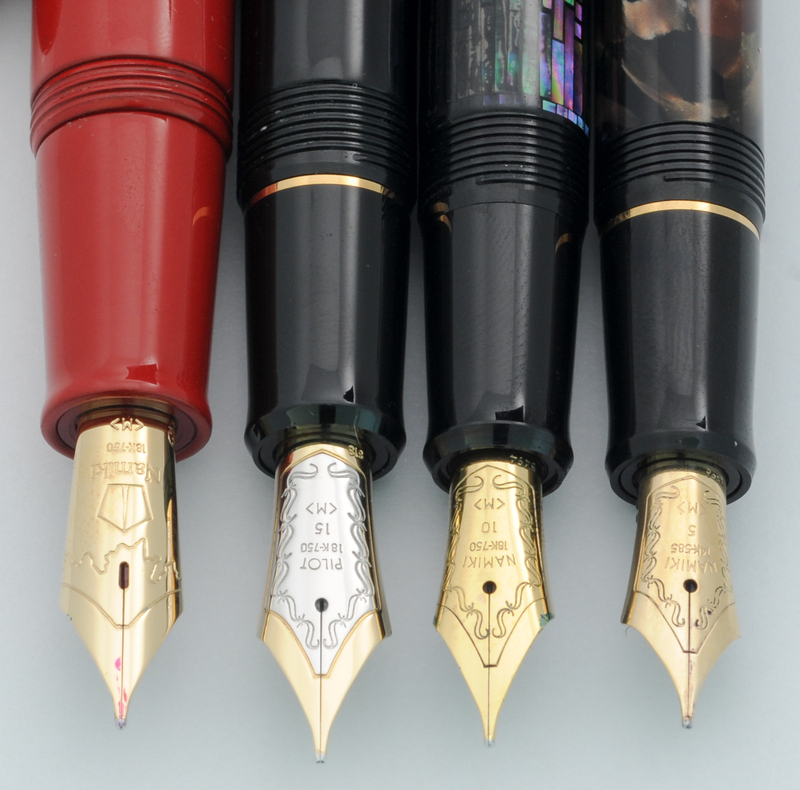 I am quite fond of vintage Montblancs because they were very well made and have wonderful nibs. 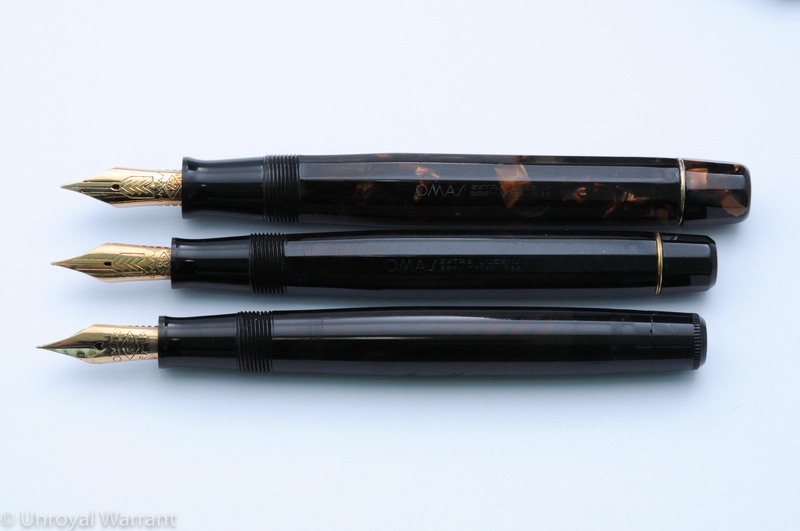 Unfortunately, these pens are expensive today, despite being mass produced. 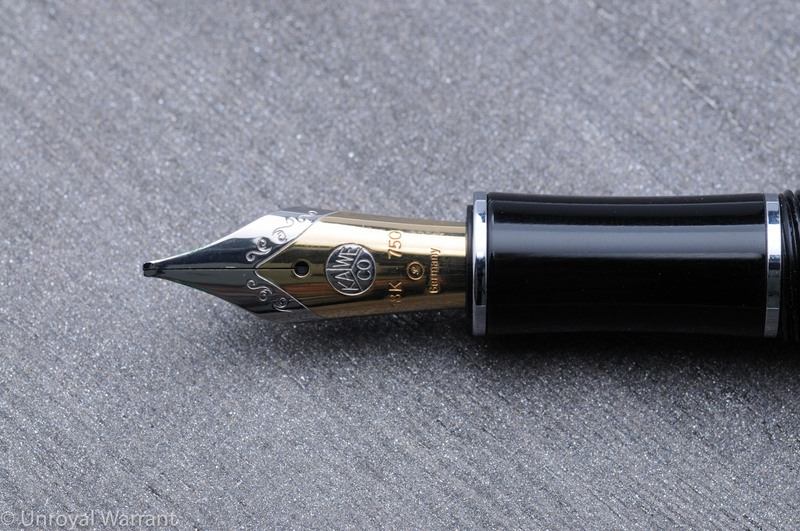 Montblanc is now very valuable luxury brand name and this has had an effect on the prices of their vintage pens. 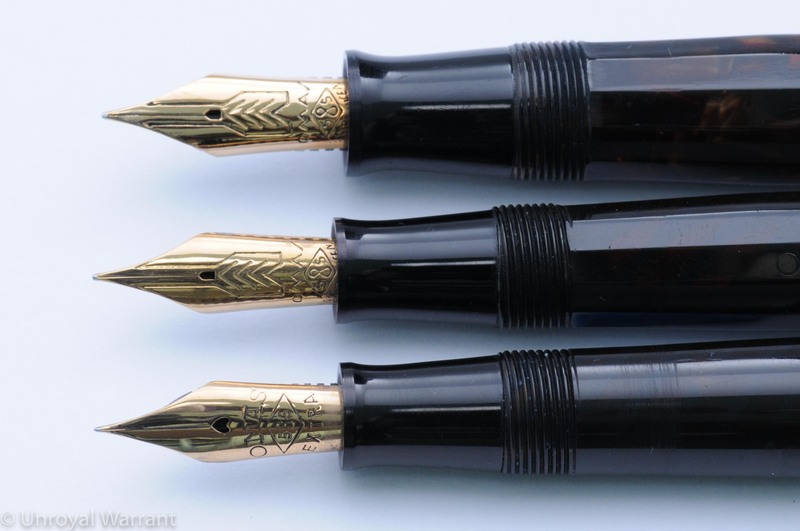 Like most pens, the larger the size in a given series the more expensive the price and that is certainly the case here. The oversized 138 and 139 are the most valuable and the 132 is the least. 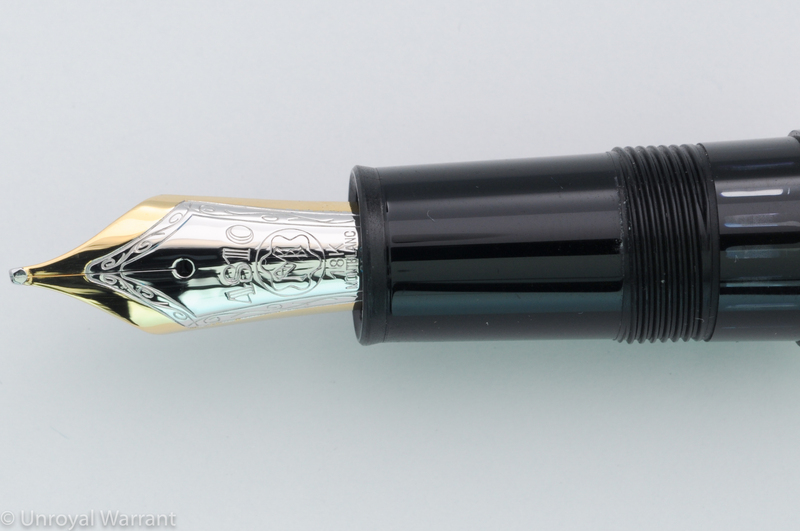 A 136 in black celluloid can range from about $400-$1,000 depending on condition. 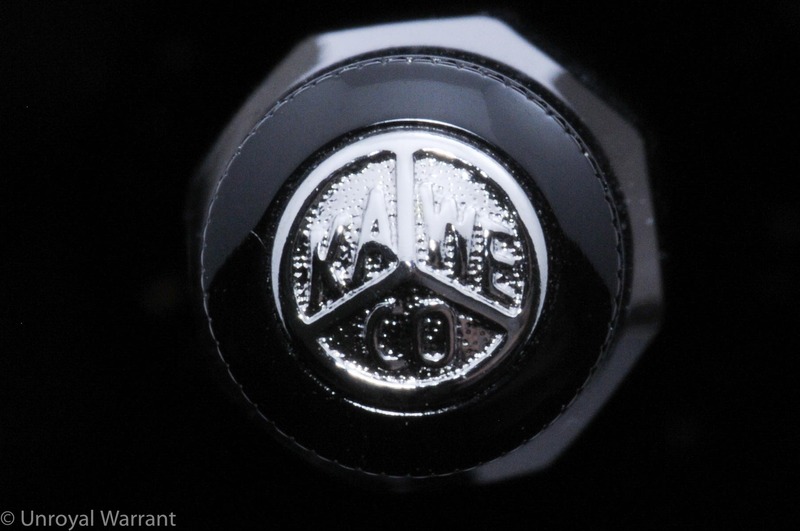 Most will be in the $600-$800 range. All piston filler Meisterstücks that I have owned are suitable for daily use; they are reliable workhorses. 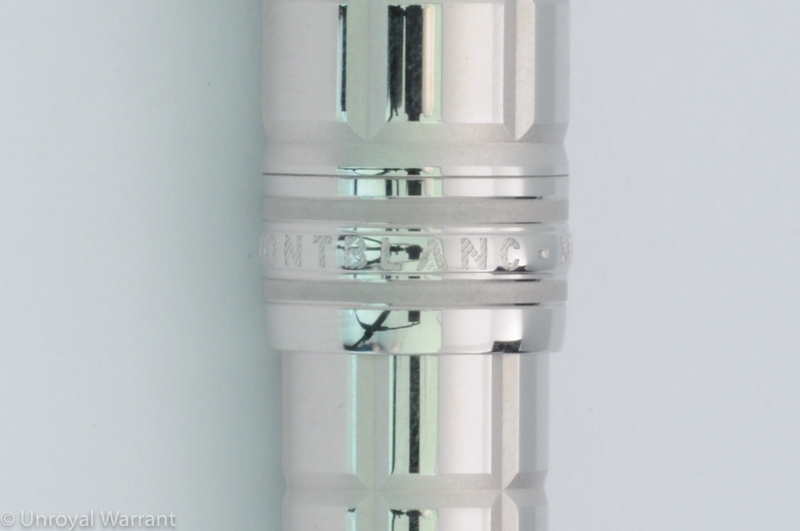 With the older celluloid models, however there are a couple of things to look out for: 1) The cork piston seal. 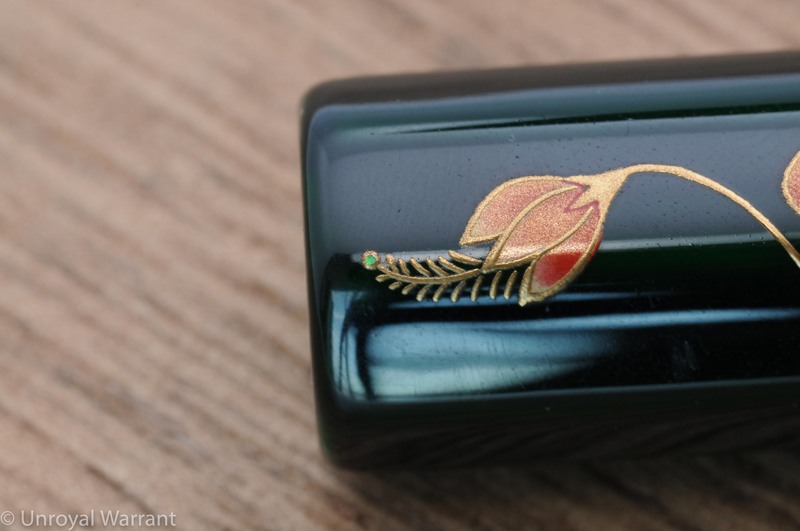 If the cork dries out there will be no seal, meaning you won’t be able to draw up ink. 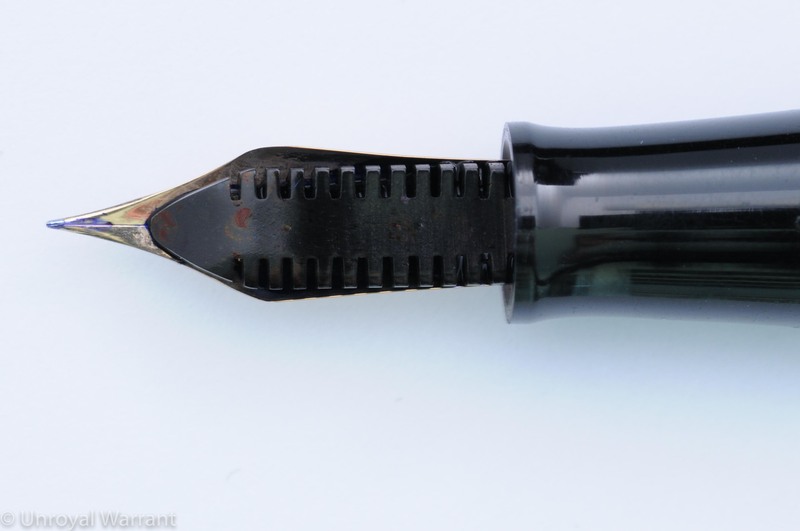 The best thing you can do to prevent this is to use the pen regularly. 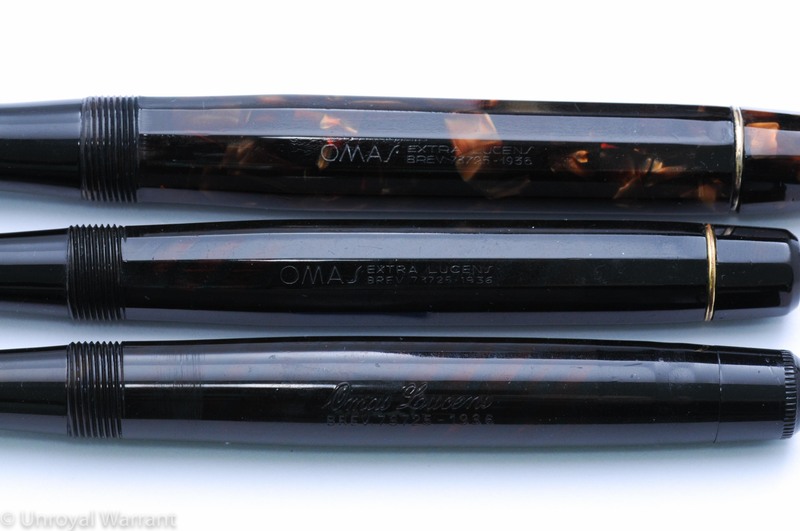 Alternatively, you can store your pen with water but be advised this method is not foolproof 2) Celluloid shrinkage. Many old Meisterstücks suffer from this and sadly there is no cure. The good news is that this rarely causes functional problems. 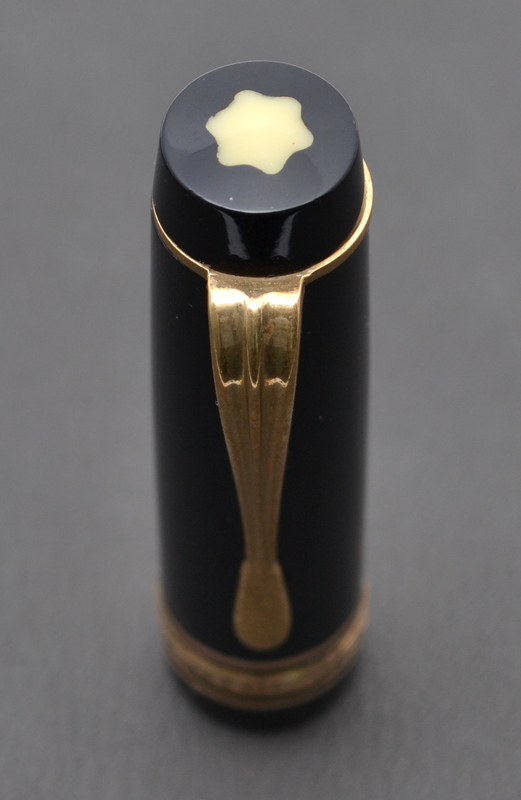 Shrinkage on the cap can cause the cap rings to come loose and you may see subtle dips and bulges on the body and cap. On my pen there is some shrinkage on the section. You can see a little bump in the middle of it. 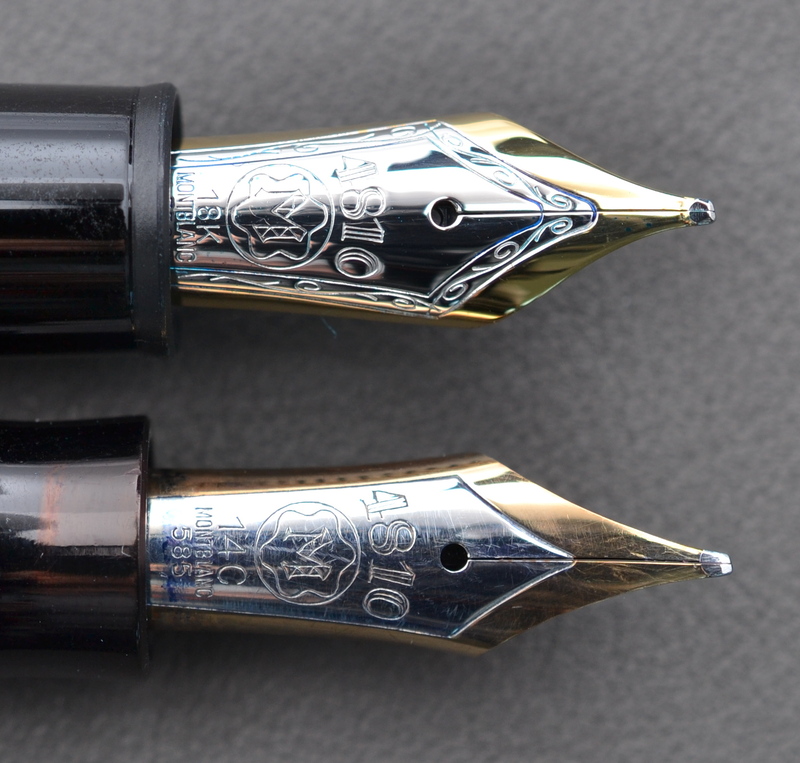 My 136 is fitted with a beautiful OB nib. 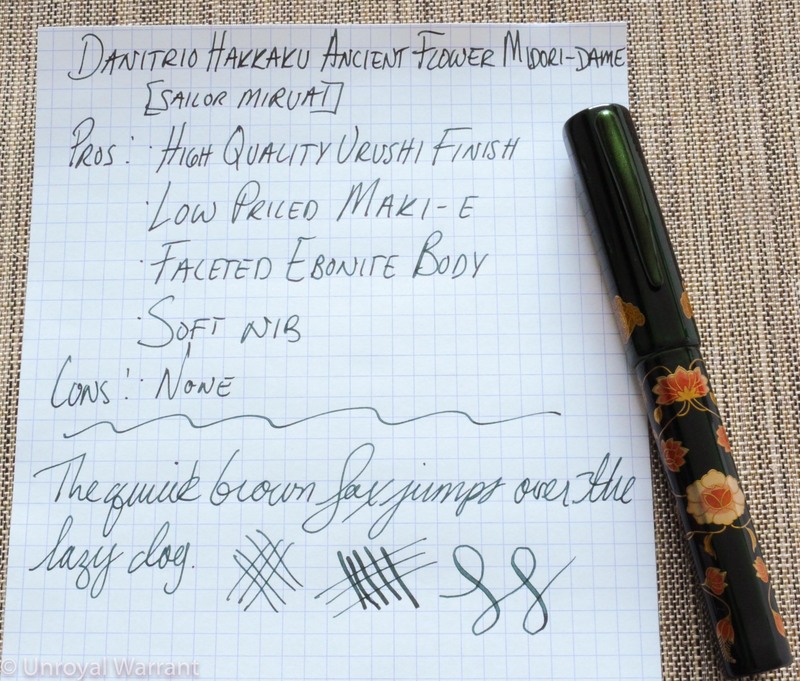 This nib is very soft and is wonderful to write with. 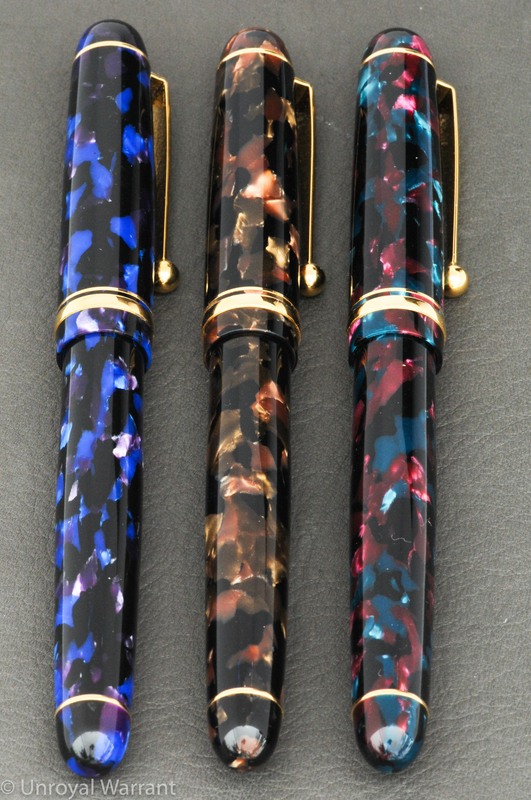 These nibs were hand made and most I have come across are very soft. 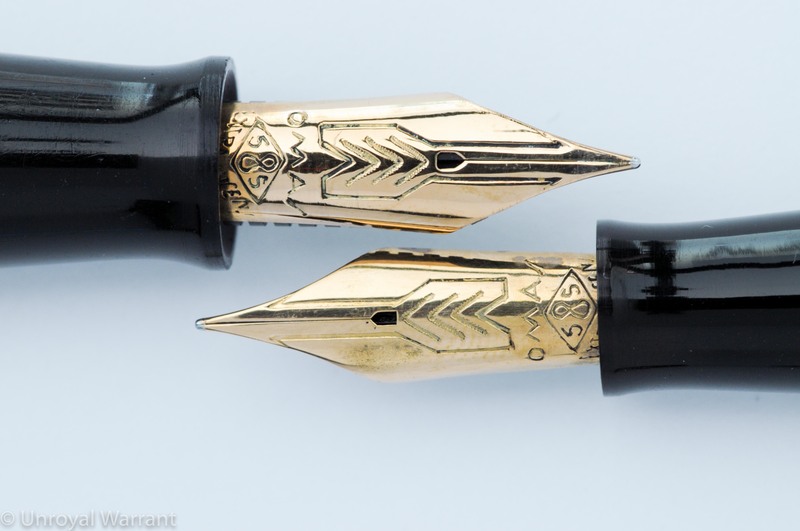 I have seen some Meisterstücks with flex nibs but these are considered extremely rare and generally command a small fortune. 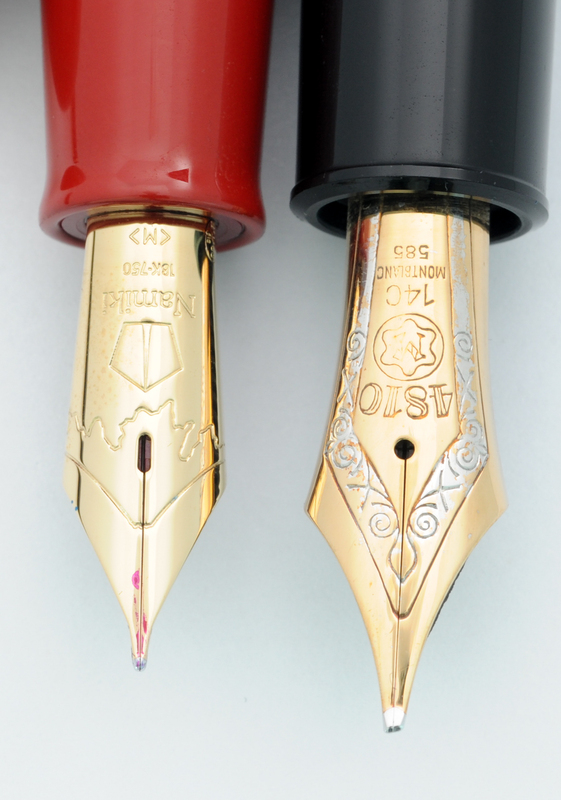 You can see that the 136 has a larger and more shapely nib compared to what is currently used on a modern 146. 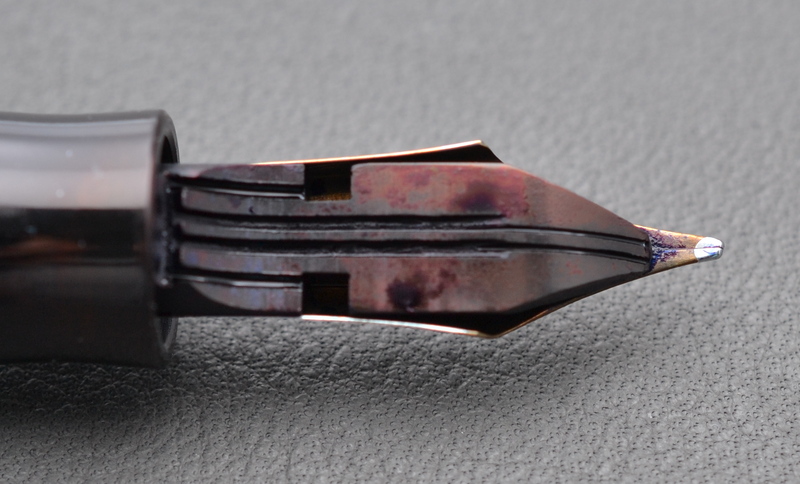 The 136 has a flat “ski-slope” ebonite feed that provides a generous amount of ink to the nib. 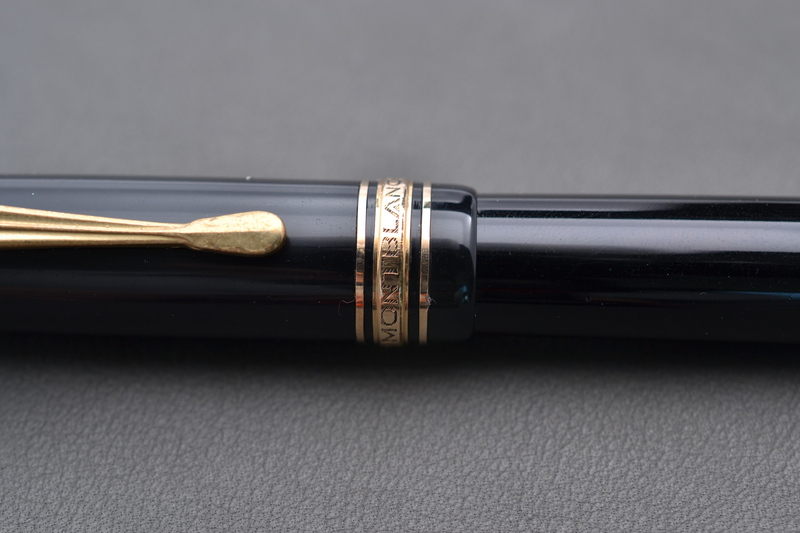 You will notice that unlike modern Meisterstücks the cap band is English, not German, and reads “MONTBLANC MASTERPIECE”. This signifies that my 136 was an export model. 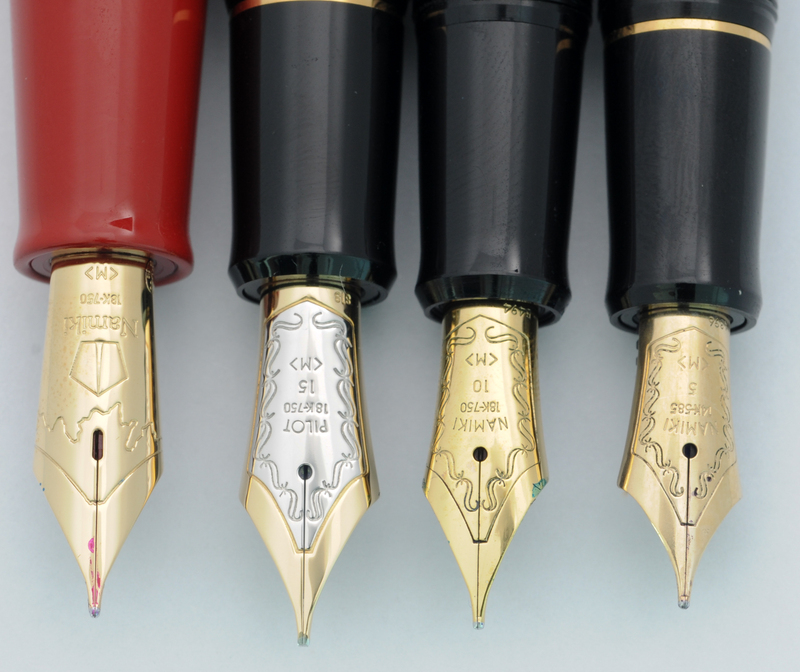 There is some debate about whether pens with “MASTERPIECE” on the cap band are more or less common than those that read “MEISTERSTÜCK”. 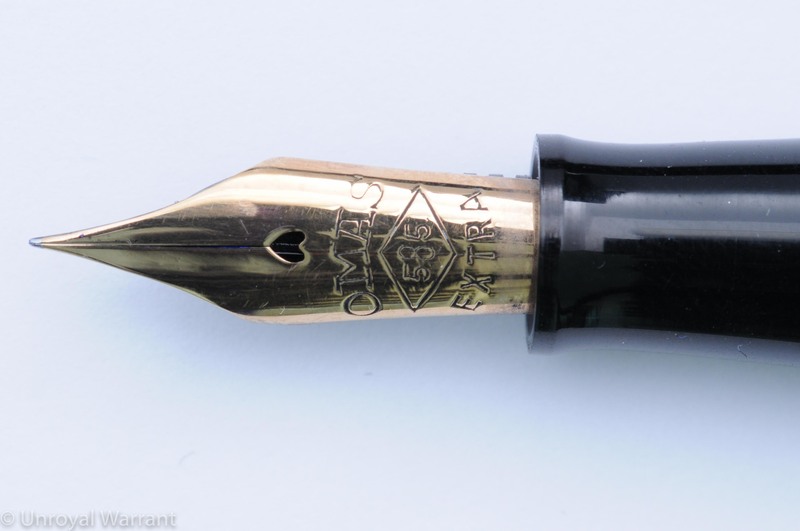 Based on what I have seen for sale on 13X and early 14X pens the cap bands in English are the most common. The 136 weighs approximately 24 grams and measures 13cm long (or about 1.5cm shorter than the current 146). The 136 feels nice in hand and is a very comfortable size. 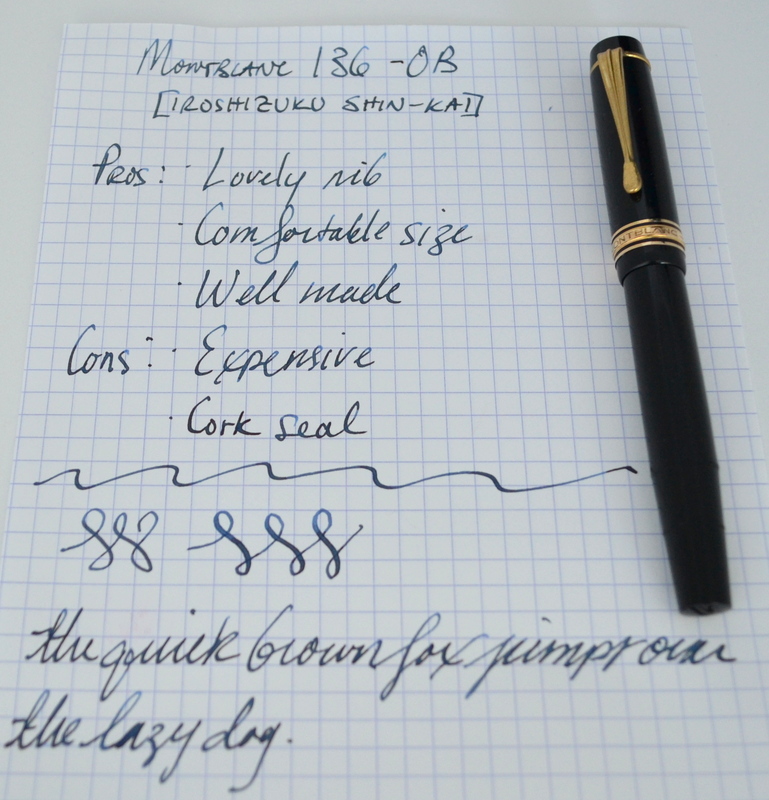 If you are looking for a vintage Montblanc I highly recommend a 136.